PCS (Permanent Change of Station) season is on the horizon, which means it’s a great time to start planning ahead. Over the past year, AHRN has gathered information from current military members to ensure a more efficient and smooth sailing PCS season. That being said, we have put together our best PCS Toolkit yet! Whether you’ve already received orders or you’re expecting them in the upcoming months, rest assured knowing our easy-to-use PCS Toolkit will help guide your transition. 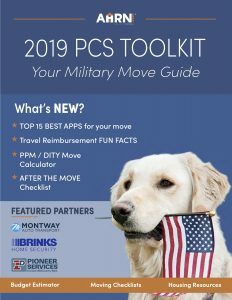 Download Your 2019 PCS Toolkit Today!